Amylulita says...: What the heck is "hipspanic"?!?! I have Google Alert tracking anything that's related to Nacotheque, Nacoteque, Marcelo Cunning, and Amylulita. Basically when there's any mention of these words on the web I get an email w/ a link when mentioned. Today I clicked on the link to UrbanDictionary.com and started cracking up w/ what I found...See for yourself! 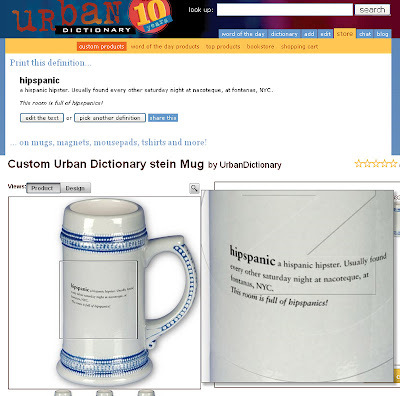 "hipspanic" - a hispanic hipster. Usually found every other saturday night at nacoteque, at fontanas, NYC. This room is full of hipspanics! Someone is trying to sell this crap online on coffee mugs, t-shirts, and whatever else, hahahaha, jajajajaja. Nice try dude, but you spelled NACOTHEQUE WRONG!! !